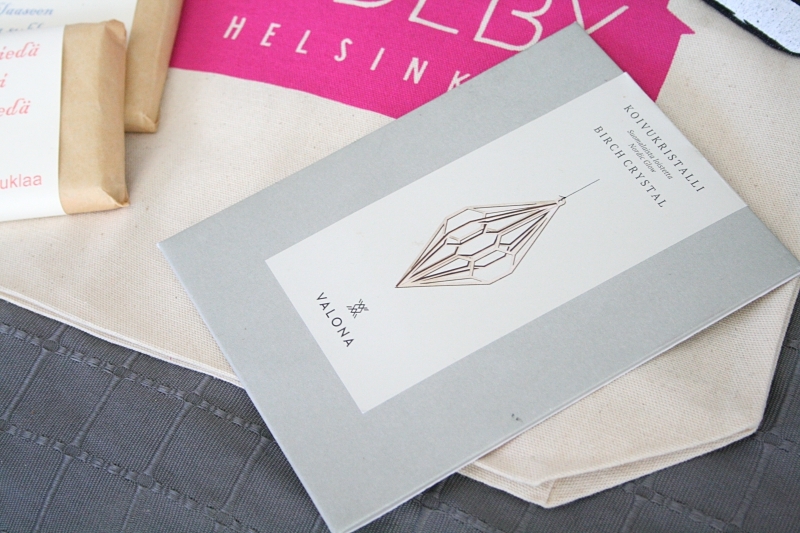 I haven't really talked a lot about the fact that I worked at Madeby Helsinki for a whole 6 months. A few weeks ago was my last day and it was fun and sad at the same time. I am really gonna miss the place and the people, but I am sure that I will be back there buying a lot. Since I have really fallen in love with a lot of the things they have. My apartment is gonna fill up soon. In this post I wanna show you what I have already gotten from there. If you wanna see me talk about these items you can watch the video I also made for my youtube channel. This is a birch crystal made by Elina Mäntylä or Valona. 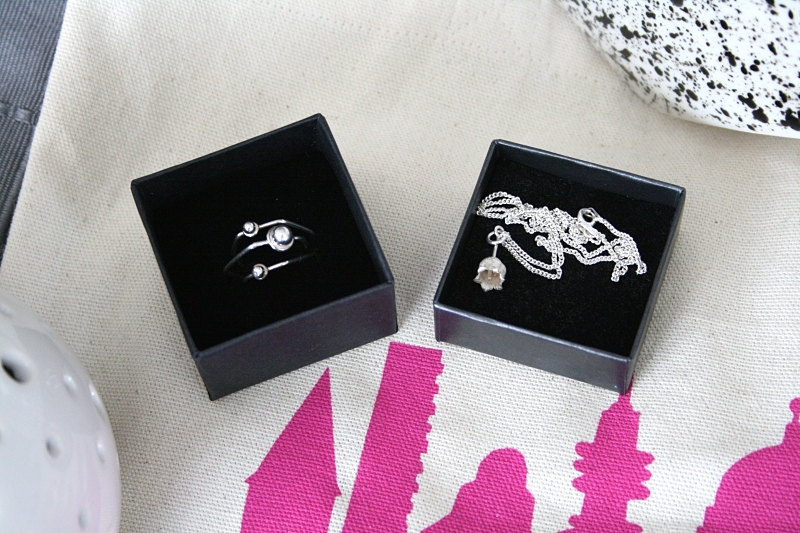 I got the black one in a diamond shape and I am in love with it. I have a really cool place for it over my bed. I will take a picture and show you guys in a post soon! They are just so pretty and delicate! 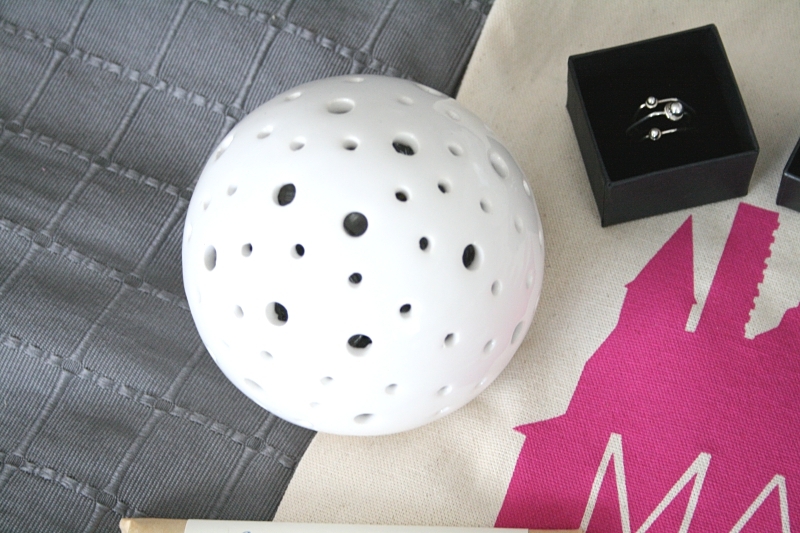 The ring is made by Tytti Lindström and I just fell in love with it pretty much right away. You all probably know that I have very small fingers so when I find a ring that fits my tiny fingers I really need to buy it. Again the picture doesn't really show you it in the best way but it will be in many outfit posts in the future. Trust me on that one! The necklace is by Satu Untinen or Maahiskoru. I have one necklace from before and I have loved it a lot. So this is just right up there with my favorites. It a small Lily of the valley and it is beautiful. I have worn it a lot since I got it and will probably wear it a lot in the future too. Here we have a little makeupbag-ish from Pisama Design which I am actually using as a wallet at the moment because I kinda got tired of having a bag-sized wallet which takes up half of the space in my bag. 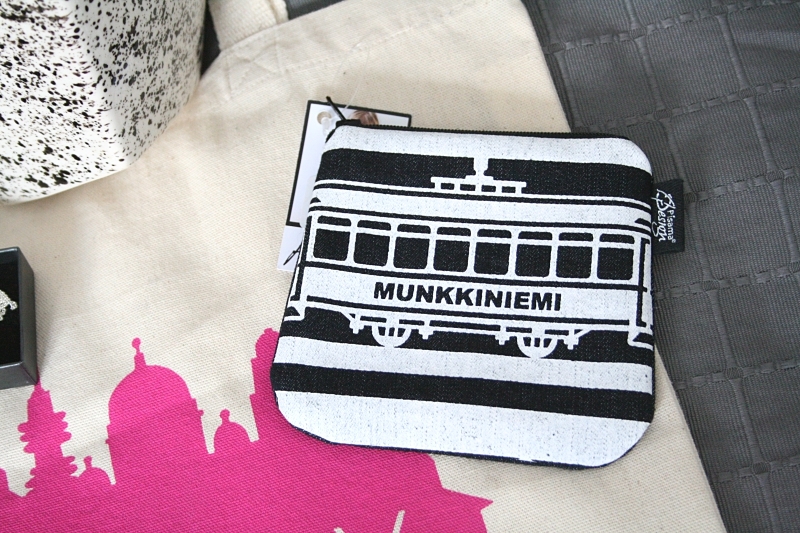 This has a tram on it with Munkkiniemi written on it. 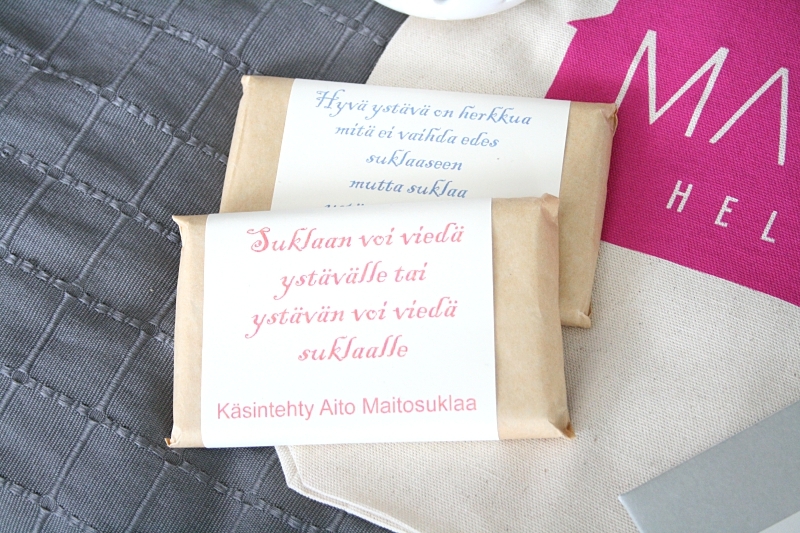 The reason why I wanted this is that I used to live in Munkkiniemi and it still feels like home. Hey, a girl can never have too much chocolate in her life, right? Well, this is awesome chocolate and it is a great little present to give to people. 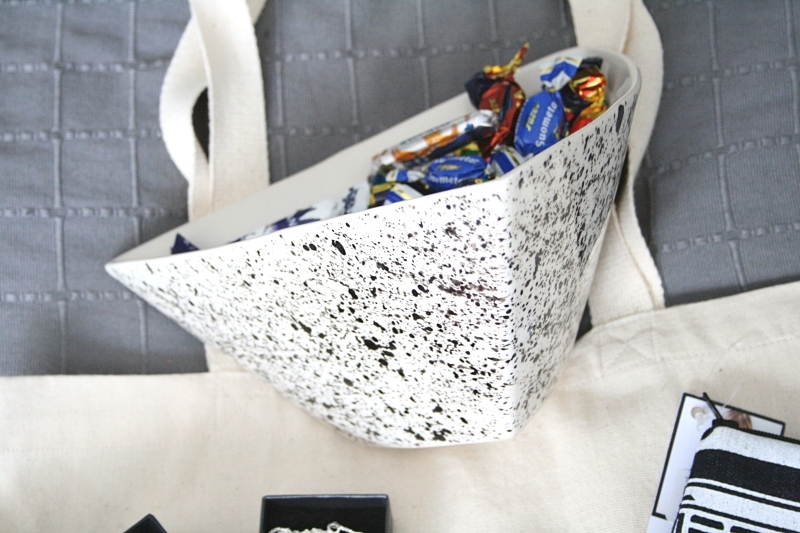 Up there we have a bowl which I have candy in. It lives on my table. I absolutely love it. It's made by Minna Rusanen or Munkaa. The ball is also hers and it lights up. You can see me light it in the video up there so I suggest you go watch it. When she came with the balls to the store I just fell in love. I just think that they are so cool! As you can see I have a pretty good variety of stuff already and I am so sure that I am gonna get more at some point. Because I really love the store and there's so much fantastic stuff. 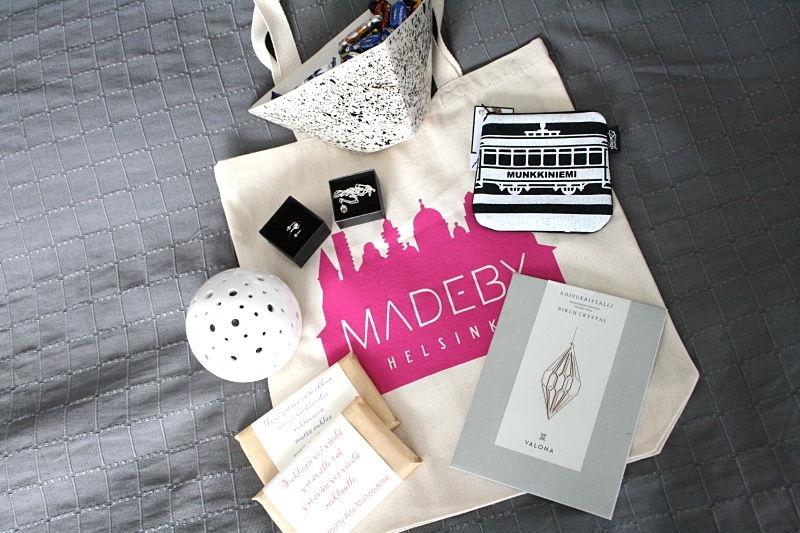 If you are looking for a present for someone then I really do recommend checking out Madeby Helsinki. It is on Katariinankatu 4. PS. Not getting paid for this post. DS.